Inspired by the Humanity in Action International Conference, the Fall International Conference (previously called the New York Conference) is a gathering for Senior Fellows and friends of Humanity in Action. 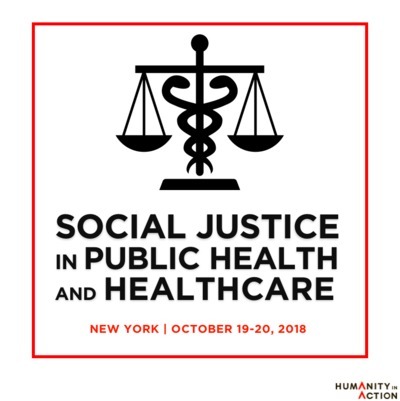 The conference will focus this year on "Social Justice in Public Health and Healthcare," exploring the current status of the United States Healthcare system, its potential and the pitfalls in between. As such a wide topic with equally as wide an impact on our lives, this conference will delve into three main categories of focus: social determinants of health, disadvantaged populations, and health insurance reform. The conference has been organized by a dedicated team of Senior Fellows led by Dr. Amish Dave (Berlin | 2006) who work within the fields of health and healthcare. We are excited to share the knowledge, expertise and hard work of these Senior Fellows. Please join us for a full day of learning and networking with old friends, as well as other members of our community who are engaged in Humanity in Action's educational mission. Same-day registration will be available! The conference is generously hosted by The New School for the sixth year in a row. For details on speakers and subjects from previous New York Conferences, see below. New School students are invited to attend the event for free. Please email conference@humanityinaction.org to receive a fee waiver code. Humanity in Action thanks The New School for its support of the 2018 Fall International Conference. Humanity in Action also thanks the many individuals who make the Fall International Conference possible through their contributions and volunteer support. See the below links to browse materials from previous conferences.